After last month’s successful trek to Matheran via Garbut, I had planned to explore Matheran from the Shivaji Ladder route. I gathered information about the route and the plan was in place. 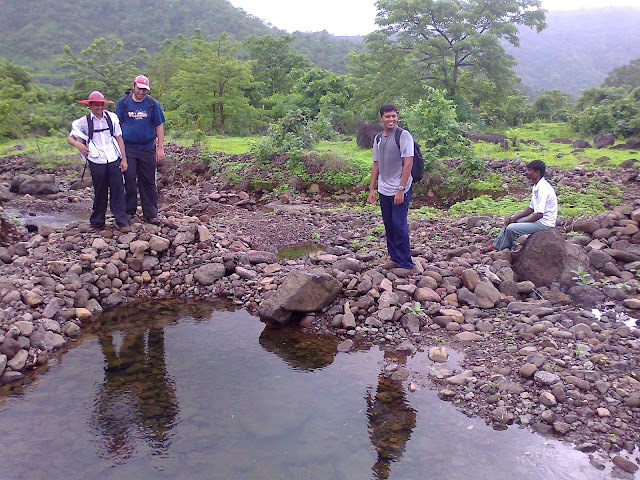 We were all set to do this trek in the first week of July but I later learned that it is risky in the monsoon, so we opted for Prabalgad via Poinje village instead. Initially, we had thought of combining Prabalgad with Irshalwadi or Thakurwadi but considering the limited time, we decided to return back via Poinje village only. , as the route here is easy. The route from Poinje Phata is less frequented and hence a bit offbeat and is also comparatively lengthy and difficult. The feel of this route is somewhat similar to that of Chanderi. 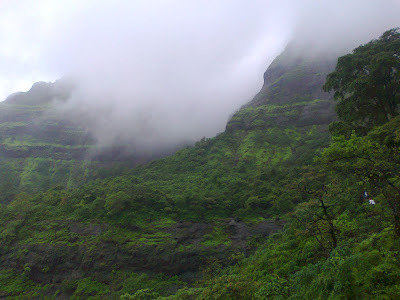 Prabalgad like Matheran is densely forested but has very few visitors and this gives it a tribal feel. 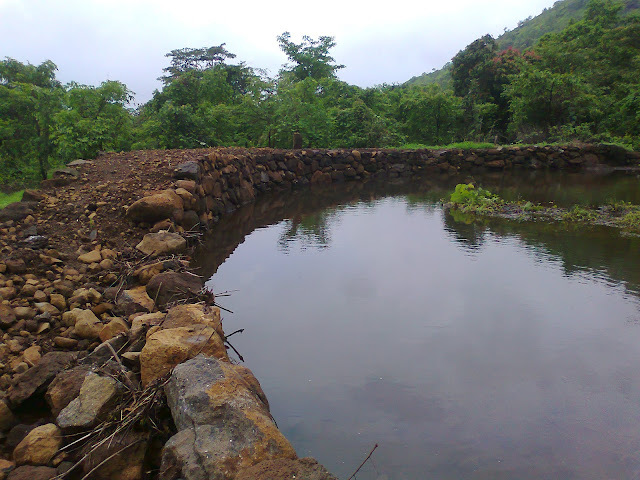 Most of the Sahyadri Mountains are enjoyable in the monsoon. We were 5 of us. (Amey Ketkar Sir, Akshay Bhaji, Bhavik Shah, Hemang S and myself). We reached Karjat by train and then took a tum-tum (minidor) to Poinje village, passing N.D. Studios, Morbe dam, and Chowk Phata on the way. We hired a guide, named Ganesh from Poinje village. It was hot in the beginning and the insects irritated us too much. But gradually, it turned cooler as we moved higher. We caught a glimpse of Manikgad while climbing. We got occasional showers on the way. The climb through the densely forested rocky path was thrilling! It took us 5hrs to reach the summit. 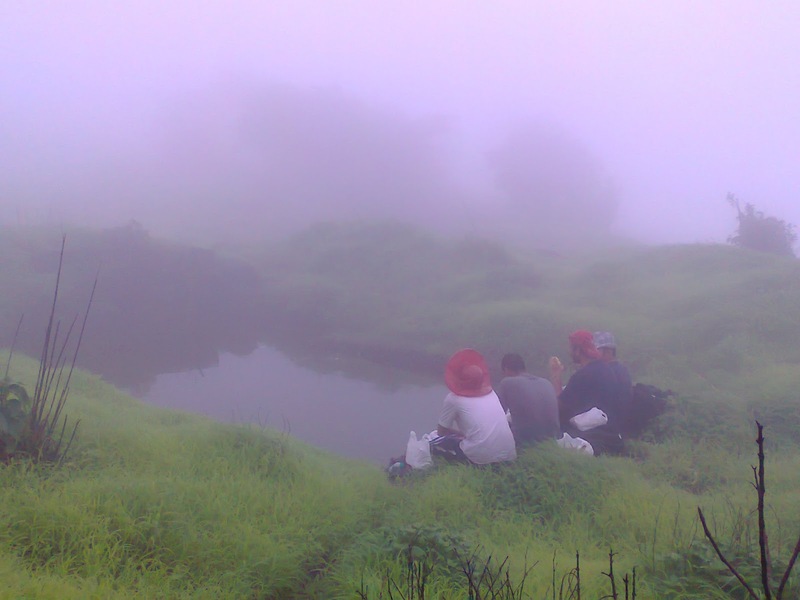 At the top we had lunch near a water tank amidst fog! Watching the baby turtles swim in the water tank was fun. Unlike its cousin Matheran, Prabalgad is a no man’s land. One wouldn’t dare to stay atop alone! It was time to leave but I was already tired. How I wished Prabal had a Dasturi naka! While descending, I scored 3 big goals (willingly & I enjoyed them). 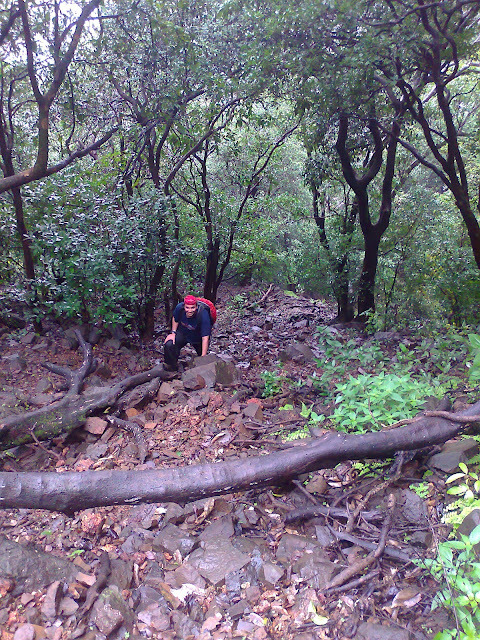 By the time we descended, the region was over flooding, as there was a good amount of rainfall that Sunday. We had a final look at the mountain range after which the monsoon clouds covered it again. While returning, we weren’t lucky to get transport back to Karjat. But when God closes one door he opens another. We got a NMMT bus up to New Bombay. We all got seats very soon. In the last seat of the bus, some Banana Wafers and Chakli coupled with hide n’ seek & Shing-Chana and a bit of melody from My Harmonica added a “picnic” touch to the trek!! 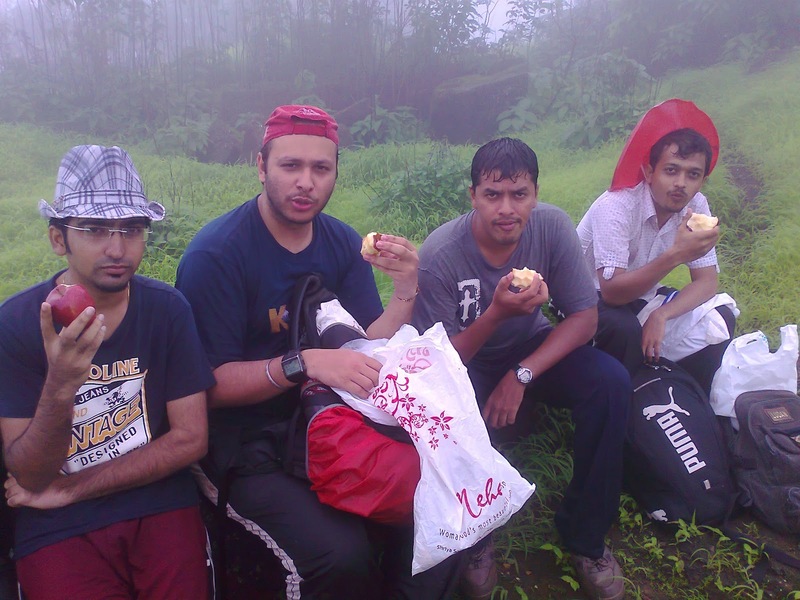 This is how we offered a Pradakshina (Revolved around) the whole Matheran range on July 7th 2012.